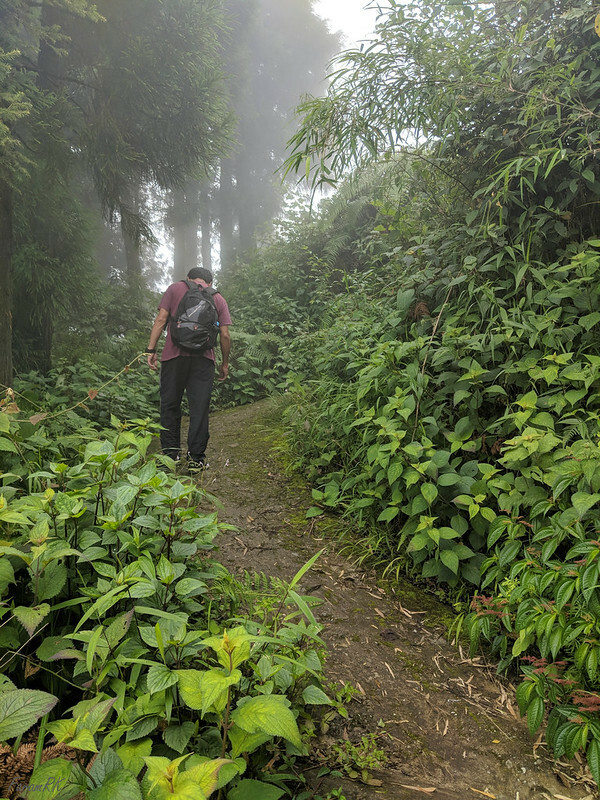 Having recently moved across the country to Siliguri, WB, in the east of India, I decided to do some short hikes in the nearby hills, in preparation for serious hiking season after the monsoon. My objective for this outing was Tonglu (elevation 9,990') near the Indo-Nepal border. On a clear day, one can view the Kanchenjunga massif from here. 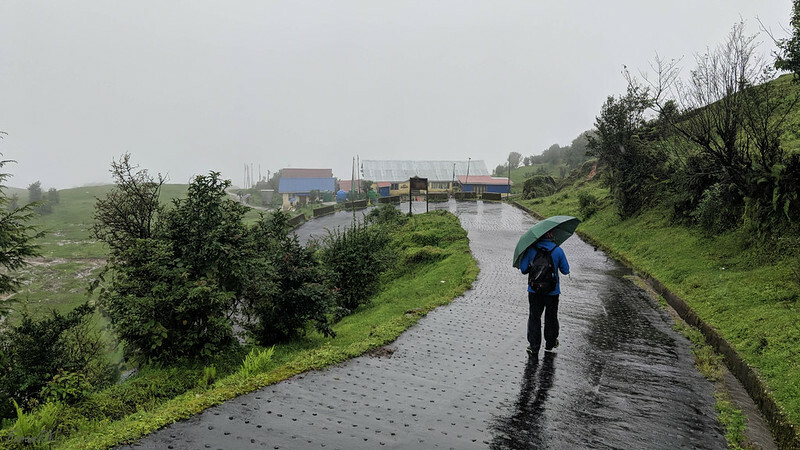 July, being the middle of the Indian monsoon season, isn't the best time for hiking in the Himalayan hills, but as my aim was to stretch my desk-bound city-bred limbs rather than take in grand mountain vistas, the season really didn't matter. I started off early in the morning at 06:10. Considering that dawn breaks here at 04:30, it really wasn't all that early :) The weather was warm and muggy even at that hour. 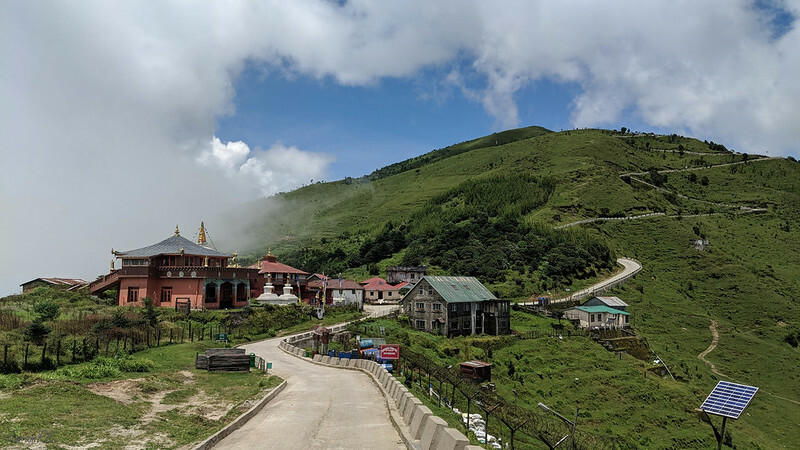 We drove north west towards Mirik (5,500'). There was a very slight drizzle on departure but this increased to heavy rain by the time we reached the last settlement in the plains, Dudhia. The river Balason exits the hills here and after crossing the bridge, the road started winding up towards Mirik ridge. As the road gained height, the rain reduced to a steady drizzle but visibility got progressively worse as we entered cloud (aka hill fog). Visibility was just a few meters and we needed to drive slowly. The road was in fairly good condition although it was quite narrow for the most part. We reached Mirik at 07:25 but due to road diversions in the town, we got lost for a while in the narrow winding streets and wasted 20 minutes trying to get out. The road ran along the ridge and at places rose to 7,500' elevation. Soon after Mirik, the road zigzagged over the Indo-Nepal border and this continued right on to the end of the drive. The border isn't sign posted and one didn't know if one was in India or Nepal at any given time. The hills all looked the same, being way above petty notions like man-made borders ! On reaching Sukhiya, the road descended to the trail head, Mane Bhanjang (6,600'). This was the only section of the road that was in bad condition with pot holes created by rain water. This town straddles the international border and the two parts are delineated by a small drain. We reached Mane Bhanjang at 08:55 i.e. 2 hours and 45 minutes after departure from Siliguri. As this was my first time in this part of the hills, I decided to hire a guide. On asking for directions to the guides office, a passerby, Rajen, turned out to be a guide himself. It had stopped raining by now and visibility was good although it was still cloudy. After a quick cup of tea at the gracious guide's home, we hit the trail at 09:15. A footpath led out of town heading north towards the first waypoint, Chitre. The moss covered stone slabs were slippery and quite steep in places requiring careful footing to avoid slipping. In some sections I preferred to walk in the brush beside the footpath as the I was unable to get any traction on the stone slabs - but this carried the inconvenience of being hit upon by leeches. Halfway through this section, it started raining and we had to bring out the rain gear. There is an all-weather road all the way up to Tonglu and beyond, and our hiking trail intersected this road at a few places. We arrived at Chitre at 10:03. It consisted of a collection of restaurants (tea-houses) beside the road. The guide said the restaurants were in Nepal as they were on the western side of the road. I found this first stage of the hike to be the toughest due to the fairly steep continuous ascent. The guide led us to his friend's restaurant where we had hot sweet black tea - great for body & spirit. 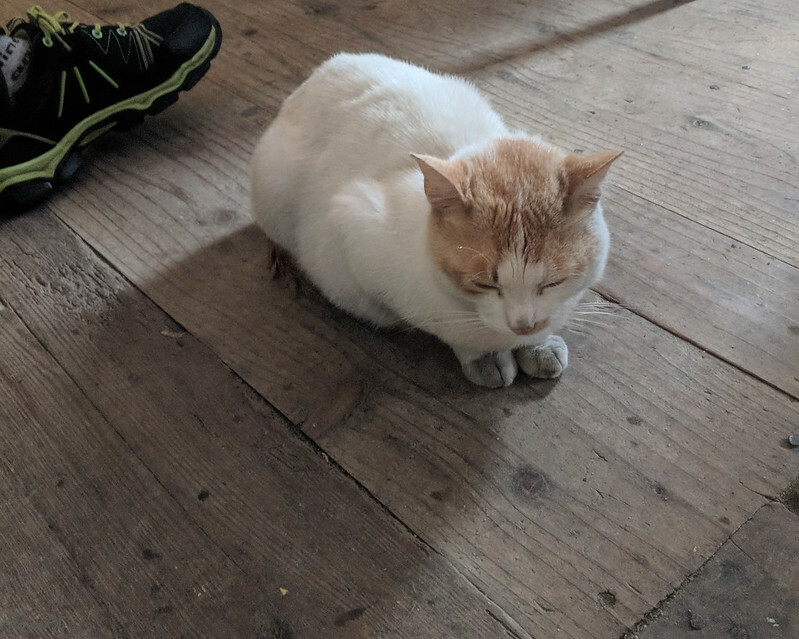 The idea was to rest for 10 minutes then resume the hike but the guide was busy catching up with friends in the restaurant so the break dragged on for nearly half an hour. We resumed walking at 10:30. The rain had now increased to a moderate downpour. Due to the enforced long break, I decided to reach the objective, Tonglu, without any further breaks, provided I didn't get too tired or run out of time. I also 'cheated' in the sense that I decided to walk on the road to Tonglu instead of the hiking footpath, because the footpath had become too slippery. On the other hand, the hard road surface wasn't easy on the feet (especially on the descent) and it was quite a bit longer than the hiking trail route. After the first stage, this one was much easier with a very gentle climb. We passed by Lama Dhurey (8,500') then moved on to Meghma (9,200'). By now the clouds had rolled in again and visibility was down to 10 meters or so. This would carry on right through the ascent and most of the descent later on. We reached Meghma at 12:15. 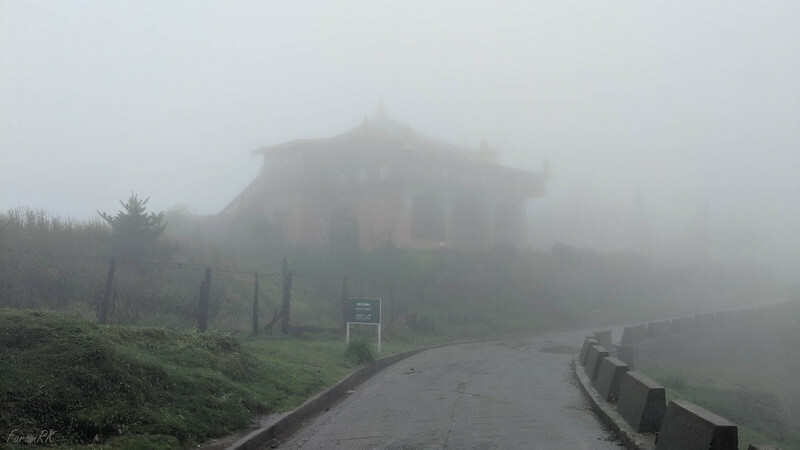 Due to the poor visibility, all we saw were a few ghostly buildings beside the road. There was a fork in the road at Meghma and we took the road going uphill and towards the right to Tonglu. This section was harder due to the increased gradient and altitude. I needed to take rest steps along the way, along with deep breathing at the slightest sign of a headache. By now I had finished my energy fuel combo - trail mix and 600ml coke :) We reached Tonglu Trekkers Hut (9,990') at 13:00 i.e. 3 hours 45 minutes after departure from Mane Bhanjang. 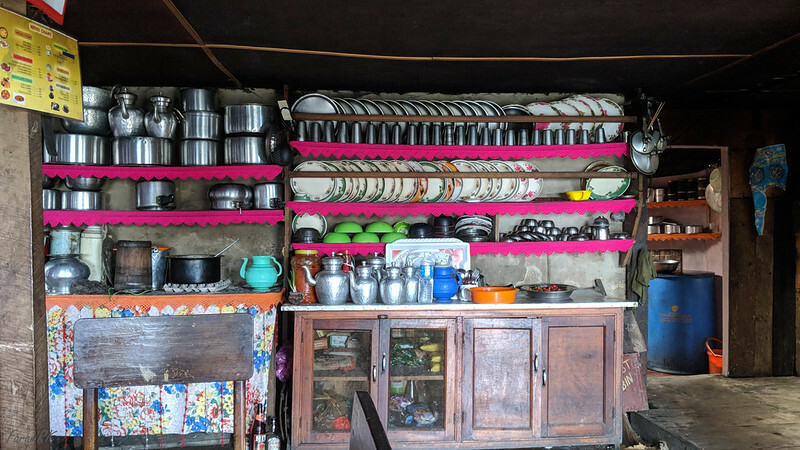 We had tea and lunch in the Trekkers hut kitchen and rested for half an hour before starting the descent. We started the descent at 13:35. In addition to the rain, there was now a cold east wind blowing which was driving clouds up the valley and into our path. Due to this and the fact that my body had cooled down, I put on a fleece and beanie under my rain jacket. We retraced our path and passed by Meghna and Lama Dhurey and reached Chitre at 15:30. We rested for 15 minutes while we had hot tea and biscuits (yet again!). Although we had ascended by the hiking footpath, we decided to return by the road as the footpath would be too slippery. Though not nearly as steep as the footpath, the gradient was still quite hard on the heels (due to the hard road surface), calves, shins and assorted lower body joints :) We finally reached Mane Bhanjang at 16:15 i.e. 2 hours 40 minutes after starting the descent from Tonglu. It took 3 hours to drive back home. 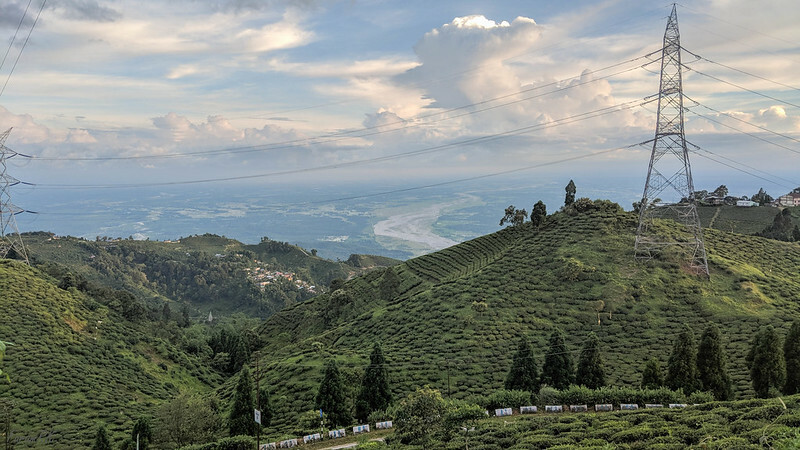 On the way back, the fog had cleared and, after Mirik, it was a scenic drive with tea gardens on either side of the road. Night fell by the time we hit the plains. Seeing that there is a road right up to Tonglu, there's no need for a guide. As there's restaurants at every waypoint, there's no need to carry too much water. Thicker socks will help if one plans to hike on the hard road surface. 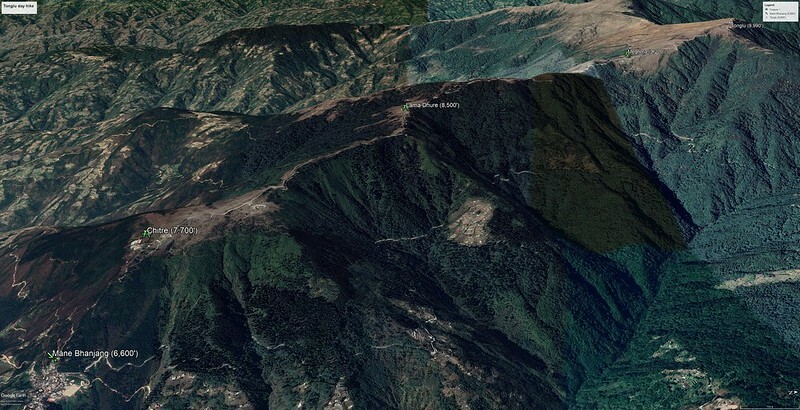 Vodafone and Airtel mobile networks worked at Mane Bhanjang but further into the hike, only Airtel worked, and that too the connection was patchy. Mobile data didn't work in any network. Finally, a word of warning - my phone automatically connected to Nepal mobile networks during the drive along the border without me being aware of it. And it seemed to have downloaded a lot of data. I got to know about it when Vodafone presented me with a big fat bill at the end of the month - welcome back to the real world ! You might like to disable international roaming before starting the hike, to prevent such unpleasant side effects. Mountain weather is fickle and one must be prepared for burning sun, cold, rain/snow, wind during the space of a single outing.